Learn how to find and replace the same word across multiple PDF documents. You’ve been keeping a beautifully curated, organized library of PDFs for your team. Suddenly, disaster strikes – you need to rebrand. It’s up to you to pore through each document and ensure that the terminology is updated throughout each document. In this tutorial, learn how you can edit PDF by searching for a word and replacing it with another across several PDF files on your computer or network folder. 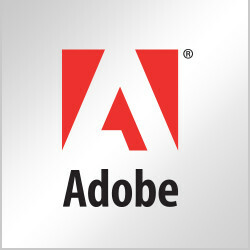 This feature is available in both Acrobat DC and Acrobat XI. Locate all the PDF files you need to update using the Advanced Search command under Edit > Advanced Search. 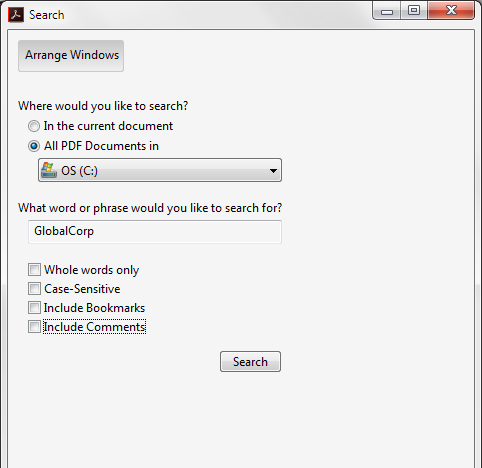 In the search dialog, select “All PDF Documents in,” and identify the search location. Enter the word you’d like to search for and ultimately replace. When the list of documents is populated, select the relevant file names. Click “Find a word in the current document” at the bottom of the dialog box. 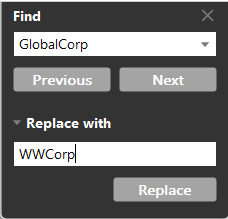 When the Find and Replace dialog box opens, simply enter the updated terminology and click “Replace.” Repeat this for each of the files in the search results.